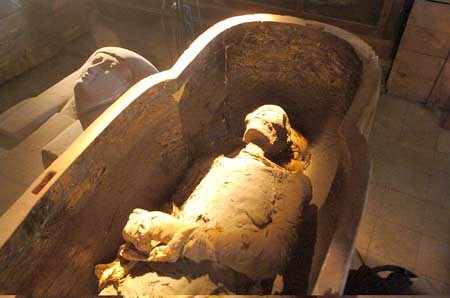 Most often when we think of mummification, what comes to mind is ancient Egypt, especially the times of the Pharaohs. Although mummification existed in other cultures, eternal life was the main focus of all Ancient Egyptians, which meant preserving the body forever. Egyptian culture believed the body was home in the afterlife to a person's Ka and Ba, without which it would be condemned to eternal wandering. Text was read from the Book of the Dead and the ritual of "opening the mouth" was performed before the tomb was sealed. 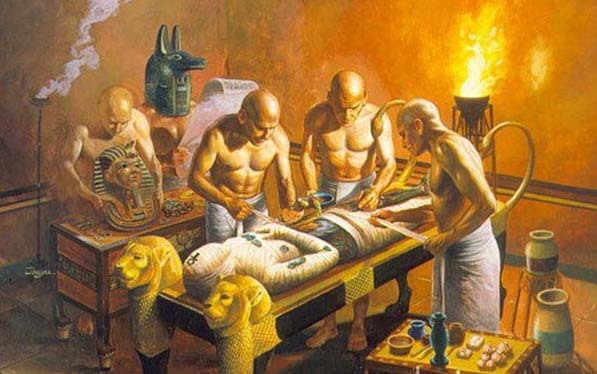 The actual process of embalming as practiced in ancient Egypt was governed by definite religious ritual. A period of seventy days was required for the preparation of the mummy, and each step in the procedure was co-ordinated with relevant priestly ceremonies. The embalmers' shop might be a fixed place, as in the case of those connected with the larger temples. Often, however, it was a movable tent which could be set up near the home of the deceased. The liver, the lungs, the stomach, and the intestines were each placed in a separate jar, the Canopic Jars, and consigned to the protection of a particular divinity. Next came the preservation of the body itself. This was accomplished in a manner somewhat similar to that of drying fish. But instead of common salt, natron, a mixture of sodium carbonate and sodium bicarbonate, with sodium chloride (common salt) and sodium sulphate as impurities, was used. Natron occurs in Egypt in a few places. Water containing natron in solution comes to the surface and is evaporated, leaving the natron as surface deposits. Only linen was used in the wrapping. To give a more natural appearance, linen pads were placed in the hollows caused by the drying. The arms and legs, sometimes even the fingers and toes, were bandaged separately. Then some twenty or more layers of alternating shrouds and bandages were wrapped around the entire body. Between every few layers of linen a coating of resin was applied as a binding agent. The proper wrapping of a mummy required several hundred square yards of linen. The shrouds were sheets six to nine feet square, and the bandages--strips torn from other sheets were from two to eight inches wide and three to twenty feet long. The linen used in wrapping mummies was for the most part not made especially for shrouds but was old household linen saved for this purpose. Often the linen is marked with the name of the former owner, faded from repeated washings. Occasionally bandages bear short religious texts written in ink. But the making of a corpse into a mummy was not all that took place during the seventy days. The artisans who were engaged meanwhile in all the activities essential to proper burial might number in the hundreds. The construction and decoration of the tomb, if not already completed by the deceased during his lifetime, presented an enormous task. Woodworkers were constructing the coffin-or a series of coffins, each to fit within another - tailored to measure. An extremely important task also undertaken during the seventy days of mummification was the preparation by priests or scribes of magical texts to be placed in the tomb. These texts, now known as the 'Book of the Dead' were written on papyrus rolls varying in length from a few sheets to many sheets, some rolls approaching a length of one hundred feet. Often they were exquisitely illustrated in color. The chapters forming the Book of the Dead contained information necessary to the deceased in overcoming obstacles on his journey and in gaining admittance to the afterworld. An elaborate funeral procession of priests, relatives, friends, servants, and professional mourners accompanied the mummy to the tomb. Attended by priests, the mummy, in its magnificent coffin, was carried on a great sledge pulled by oxen. The mourners followed behind the sledge. In the procession, too, were porters bearing gifts to be placed in the tomb. These mortuary accouterments believed essential for a happy afterlife might be furniture, weapons, jewelry, food, linens - any or all of those things that had made for comfort and happiness in the earthly life. Most impressive of all Egyptian tombs are those of the Pyramid Age (2800-2250 B.C.). Those colossal tombs that are as famous as Egypt herself developed from a less elaborate form now called "mastaba" (from the Arabic word mastabah, meaning "bench," which describes the form of the superstructure of the tomb). The mastaba tombs are low, rectangular structures of brick and stone built on bedrock. The building houses an offering chamber, or a series of them, and a secret room containing a statue of the deceased. In the early days of mummification only the kings were definitely conceded the opportunity to attain an exalted afterlife. Religious texts to aid the dead kings in gaining entrance into heaven were carved on the stone walls of the mortuary chambers of some of the pyramids. These are now known as the Pyramid Texts. It is on the walls of the pyramids of the Fifth and Sixth Dynasty kings at Saqqara -smaller and less imposing pyramids than those at Giza - that these oldest collections of Egyptian religious texts are found. 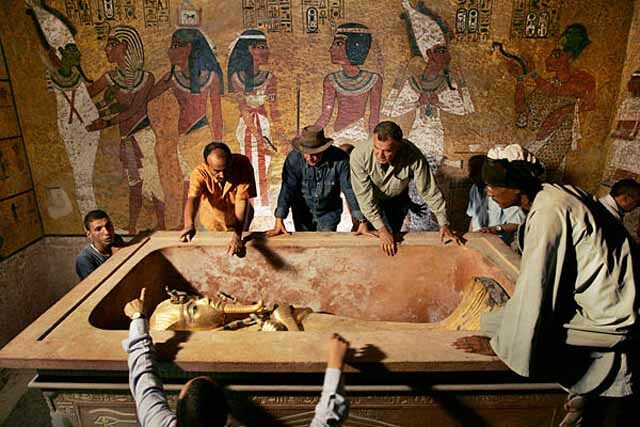 Although nobles of the Pyramid Age were also accorded sumptuous burial, no texts are found in their tombs. These buildings served as chapels or offering chambers. The mummy of the Middle Kingdom was placed on its left side in a rectangular wooden coffin on which was painted religious texts. These Coffin Texts were excerpts from the older Pyramid Texts, with the addition of new thoughts and symbols. Some mummies had a cartonnage mask over the upper portion of the body. These cartonnage coverings--layers of linen or papyrus soaked in plaster - were shaped in human form and painted. Sometimes the entire mummy was enclosed in such a covering, a practice which quickly led to the making of coffins themselves in mummy form. The animals were mummified, but not always too carefully. Chief stress was laid on the bandaging, the object having been that the package should clearly indicate the kind of animal enclosed. Often these animal mummies were placed in theriomorphic coffins. There are mummies of jackals, cats, ibises, snakes, lizards, gazelles, hawks, bulls, sheep, baboons, crocodiles--in fact, almost every conceivable kind of animal known to Egypt. 'Mummy dust' was sometimes stolen from the Sarcophagi and sold. Artists also made use of Egyptian mummies; the brownish paint known as Caput mortuum (Latin for death's head) was originally made from the wrappings of mummies. It was most popular in the 17th century but was discontinued in the early 19th century when its composition became generally known to artists. 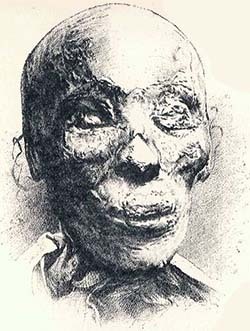 Thutmose II's mummy was discovered in the Deir el-Bahri cache, revealed in 1881. He was interred along with other 18th and 19th dynasty leaders including Ahmose I, Amenhotep I, Thutmose I, Thutmose III, Ramesses I, Seti I, Ramesses II, and Ramesses IX. Ramesses II was originally buried in the tomb KV7 in the Valley of the Kings but, because of looting, priests later transferred the body to a holding area, re-wrapped it, and placed it inside the tomb of queen Inhapy. Seventy-two hours later it was again moved, to the tomb of the high priest Pinudjem II. All of this is recorded in hieroglyphics on the linen covering the body. His mummy is today in Cairo's Egyptian Museum. 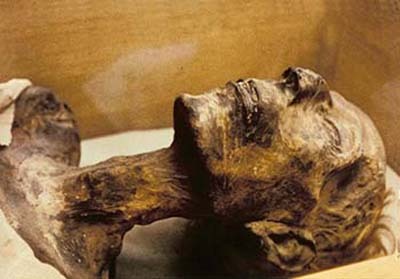 The pharaoh's mummy reveals an aquiline nose and strong jaw, and stands at some 1.7 metres (5 ft 7 in). His ultimate successor was his thirteenth son, Merneptah. The Gebelein predynastic mummies are six naturally mummified bodies, dating to approximately 3400 BC from the Late Predynastic period of Egypt, and were the first complete pre-dynastic bodies to be discovered. The well-preserved bodies were excavated at the end of the nineteenth century by Wallis Budge, the British Museum Keeper for Egyptology, from shallow sand graves near Gebelein (modern name Naga el-Gherira) in the Egyptian desert. Budge excavated all the bodies from the same grave site. Two were identified as male and one as female, with the others being of undetermined gender. The bodies were given to the British Museum in 1900. Some grave-goods were documented at the time of excavation as "pots and flints", however they were not passed on to the British Museum and their whereabouts remain unknown. Three of the bodies were found with coverings of different types (reed matting, palm fibre and an animal skin), which still remain with the bodies. The bodies were found in foetal positions lying on their left sides. From 1901 the first body excavated has remained on display in the British Museum. This body was originally nicknamed 'Ginger' due to his red hair; this nickname is no longer officially used as part of recent ethical policies for human remains. It also wasn�t until the Middle Kingdom that embalmers used natural salts to remove moisture from the body. The salt-like substance natron dried out and preserved more flesh than bone. Once dried, mummies were ritualistically anointed with oils and perfumes. 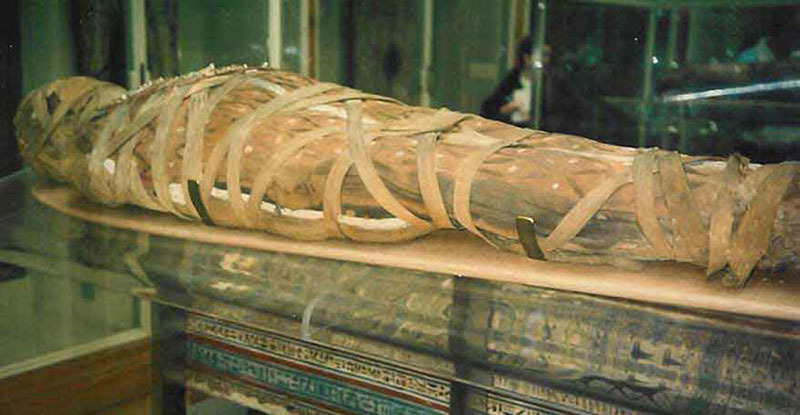 The 21st Dynasty brought forth its most advanced skills in embalming and the mummification process reached its peak. The bodies' abdomens were opened and all organs, except for the heart, were removed and preserved in Canopic jars. The brain, thought to be useless, was pulled out through the nose with hooks, then discarded. It was also drained through the nose after being liquefied with the same hooks. The emptied body was then covered in natron, to speed up the process of dehydration and prevent decomposition. Natron dries the body up faster than desert sand, preserving the body better. Often finger and toe protectors were placed over the mummies fingers and toes to prevent breakage. They were wrapped with strips of white linen that protected the body from being damaged. After that, they were wrapped in a sheet of canvas to further protect them. 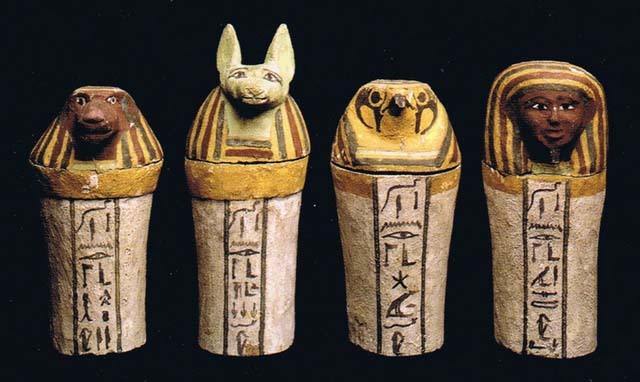 Many sacred charms and amulets were placed in and around the mummy and the wrappings. This was meant to protect the mummy from harm and to give good luck to the Ka of the mummy. Once preserved, the mummies were laid to rest in a sarcophagus inside a tomb, where it was believed that the mummy would rest eternally. In some cases the mummy's mouth would later be opened in a ritual designed to symbolize breathing, giving rise to legends about revivified mummies. Liber Linteus is the longest Etruscan text and the only extant linen book, dated to the 3rd century BC. It remains mostly untranslated because of the lack of knowledge about the Etruscan language, though the few words which can be understood indicate that the text is most likely a ritual calendar. The fabric of the book was preserved when it was used for mummy wrappings in Ptolemaic Egypt. The mummy was bought in Alexandria in 1848 and since 1867 both the mummy and the manuscript have been kept in Zagreb, Croatia, now in a refrigerated room at the Archaeological Museum. In the necropolis of Saqqara, Egypt, researchers discovered a broken jar containing what appeared to be a hunk of 3,300-year-old cheese - possibly the oldest known cheese in the world. If you are still disappointed about being denied the opportunity to drink the toxic red mummy juice unearthed in Egypt last month, we have some good news for you. Researchers have just discovered the world's oldest cheese (also in Saqqara, Egypt), and it is almost certainly cursed... or at least contaminated. The cheese in question was discovered among a large cache of broken clay jars inside the tomb of Ptahmes, former mayor of Memphis (ancient Egypt, not Tennessee) and a high-ranking official during the reigns of pharaohs Seti I and Ramesses II. The tomb is thought to have been built in the 13th century B.C., making it - and the cheese within - about 3,300 years old. The ancient Egyptians developed sophisticated embalming treatments far earlier and across a wider geographical area than had been previously known, forensic tests on a well-known prehistoric mummy have revealed.It is the first time that extensive tests have been carried out on an intact prehistoric mummy, consolidating the researchers' previous findings that embalming was taking place 1,500 years earlier than previously accepted. Dating from c.3700-3500 BC, the mummy has been housed in the Egyptian Museum in Turin since 1901, but unlike the majority of other prehistoric mummies in museums, it has never undergone any conservation treatments, providing a unique opportunity for accurate scientific analysis. Like its famous counterpart Gebelein Man A in the British Museum, the Turin mummy was previously assumed to have been naturally mummified by the desiccating action of the hot, dry desert sand. Examination of a mummy has revealed the original ancient Egyptian embalming recipe - first used to preserve bodies. A battery of forensic chemical tests carried out on a mummy that dated from 3,700-3,500 BC revealed the recipe and confirmed that it was developed far earlier and used more widely than previously thought. 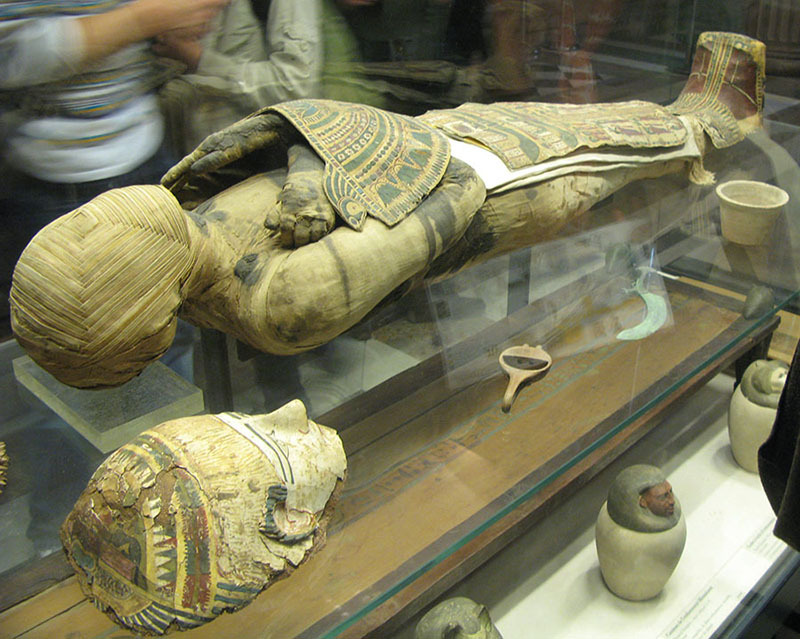 The Egyptian Museum in Turin, Italy, is now home to the mummy in question. Archaeologists at Sydney University have discovered the remains of a 2,500-year-old Egyptian mummy in a coffin that was in storage for 150 years. The researchers are now using modern technology to study the remains and hope to shed new light on the ancient civilisation. The world's earliest figurative tattoos have been discovered on 5,000-year-old Egyptian mummies at the British Museum, rewriting the history of inking. The tattoos are of a wild bull and a Barbary sheep on the upper-arm of a male mummy, and S-shaped motifs on the upper-arm and shoulder of a female. The find dates tattoos containing imagery rather than geometric patterns to 1,000 years earlier than previously thought. Researchers say the discovery 'transforms' our understanding of how people lived during this period. 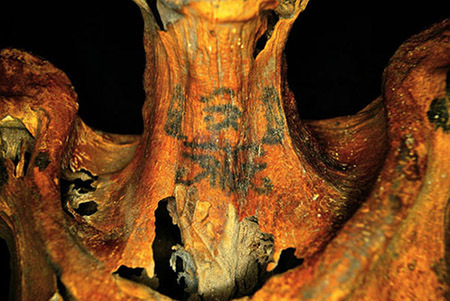 Researchers have discovered the oldest figurative tattoos in the world on two 5,000-year-old mummies from Egypt. The illustrations are of a wild bull and a Barbary sheep on the upper-arm of a male mummy, and S-shaped motifs on the upper-arm and shoulder of a female. The discovery pushes back evidence for the practice in Africa by 1,000 years. Researchers in London have developed scanning techniques that show what is written on the papyrus that mummy cases are made from. These are the decorated boxes into which the wrapped body of the deceased was placed before it was put in a tomb. They are made from scraps of papyrus which were used by ancient Egyptians for shopping lists or tax returns. The technology is giving historians a new insight into everyday life in ancient Egypt. The hieroglyphics found on the walls of the tombs of the Pharaohs show how the rich and powerful wanted to be portrayed. It was the propaganda of its time. The new technique gives Egyptologists access to the real story of Ancient Egypt, according to Prof Adam Gibson of University College London, who led the project. More than 1,800 years ago, an artist in ancient Egypt painted the portrait of a large-eyed woman wearing a red tunic � a painting that ended up resting on the woman's dead, mummified body. The exact materials and methods the artist used to capture the woman's likeness were unknown, but were recently deciphered in amazing detail, according to a new study. With the new technique, the researchers figured out not only the raw materials used to create the painting, but also the order in which they were applied, the researcher said. Egyptian authorities unveiled a previously undiscovered ancient tomb belonging to a goldsmith and his wife near Luxor in southern Egypt on Saturday. The tomb, at the Draa Abul Nagaa necropolis, contains "mummies, sarcophagi, statuettes, pots and other artifacts," according to Egypt's Ministry of Antiquities. It belonged to Amenemhat -- which means the god "Amen Is In the Forefront" -- and his wife Amenhotep, said Mostafa Al-Waziri, who led the Egyptian team which unearthed the 3,500-year-old tomb. 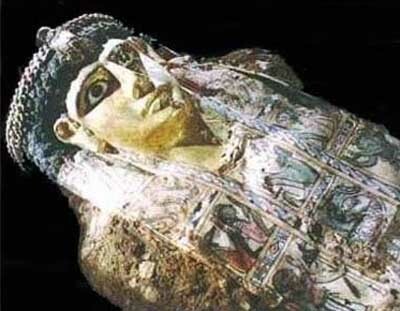 While Amenhotep is usually a man's name, Waziri said, the team found references inside the tomb that indicated she was the lady of the house. CNN was the first media outlet to be given access to the tomb on the day of the announcement. Archaeologists in Egypt have discovered the tomb of a royal goldsmith containing the mummies of a woman and her two children, authorities said. The tomb, dating back to the New Kingdom (16th to 11th Centuries BC), was found near the Nile city of Luxor, 400 miles (700km) south of Cairo. Among the items discovered inside was a statue of the goldsmith Amenemhat, sitting beside his wife. It is unclear whether the three mummies discovered are connected to Amenemhat. The mummies were found down a burial shaft leading off the main chamber, Egypt's Ministry of Antiquities said. Archaeologists used to unwrap Egyptian mummies with much fanfare in front of crowds, a stunt that destroyed cultural history and disrespected the deceased individual. Now, researchers can use computed tomography (CT) scans to noninvasively learn about mummies without literally unwrapping them. Here is a look at the science behind "Mummies," an exhibit about Peruvian and Egyptian mummies that runs from March 20 until Jan. 7, 2018, at the American Museum of Natural History in New York, and then returns to the Field Museum of Natural History in Chicago. Scans of what was thought to be a 2,300-year-old hawk reveal it to be a miscarried baby. 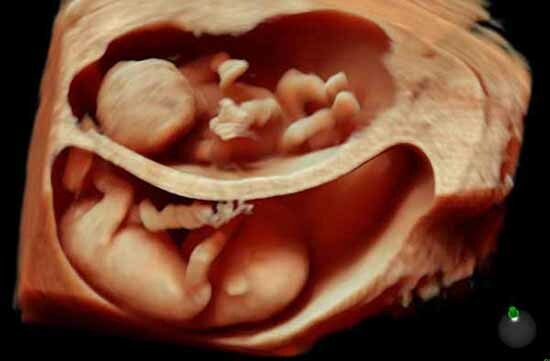 The remains, which are preserved in a tiny sarcophagus, are now believed to belong to a miscarried 20-week gestation fetus. It is the latest in a series of remarkable discoveries made by medical experts analyzing ancient Egyptian artifacts at Maidstone Museum, Kent. A 3,800-year-old ancient Egyptian mummy has been discovered in a necropolis and may have been one of the most important figures in the civilization's history. Archaeologists unearthed the tomb in the necropolis of Qubbet el-Hawa in southeastern Egypt and believe it belonged to a woman called 'Lady Sattjeni', a key figure in the Middle Kingdom. They say the body was found in extremely good condition, wrapped in linen and deposited inside two wooden coffins. Curators at a British museum have discovered what they claim is the youngest mummy from ancient Egypt - a mummified fetus believed to be between 16 and 18 weeks old. For more than 2,500 years, the tiny body has been resting in a small wooden coffin, the arms crossed over its chest. The coffin was excavated at Giza in 1907 by the British School of Archaeology and came into the collection of the Fitzwilliam Museum in Cambridge, U.K., the same year. Over the years, scientists have found evidence of cancers, heart disease, starvation, ulcers, smallpox, tuberculosis and other infections in ancient remains from all over the world. 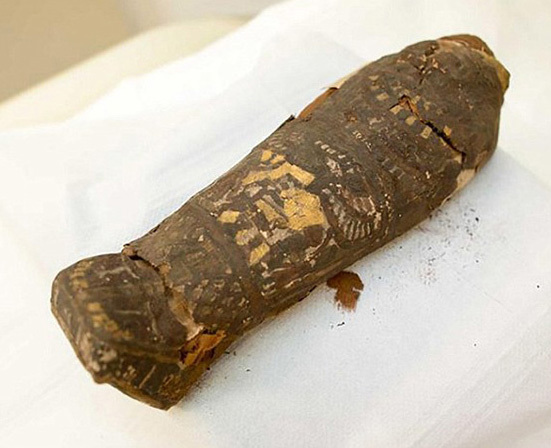 Now, for the first time ever, researchers using CT scans have detected a diseased kidney in an ancient Egyptian mummy. A kidney normally would decay long before the 2,800 years that have elapsed since the man named Irtieru was embalmed, but it appears he had a kidney disease called renal tuberculosis that calcified (hardened) the organ. A text that may be the oldest copy of a gospel known to exist - a fragment of the Gospel of Mark that was written during the first century, before the year 90 - is set to be published. At present, the oldest surviving copies of the gospel texts date to the second century (the years 101 to 200). This first-century gospel fragment was written on a sheet of papyrus that was later reused to create a mask that was worn by a mummy. Although the mummies of Egyptian pharaohs wore masks made of gold, ordinary people had to settle for masks made out of papyrus (or linen), paint and glue. Given how expensive papyrus was, people often had to reuse sheets that already had writing on them. Archaeologists have discovered the final resting place of at least 50 royal Egyptians - including princes, princesses and infants - while excavating a trashed tomb at the Valley of the Kings. Hieratic inscriptions (a cursive form of hieroglyphs) revealed that most of the mummies in the tomb were related to two pharaohs, Thutmose IV and Amenhotep III, who ruled during the 14th century B.C. The dead included at least eight previously unknown royal daughters, four princes and some children, the archaeologists said. An ancient Egyptian mummy found with an intact brain, but no heart, has a plaque on her abdomen that may have been intended to ritually heal her, say a team of researchers who examined the female body with CT scans. The woman probably lived around 1,700 years ago, at a time when Egypt was under Roman rule and Christianity was spreading, according to radiocarbon dating. Her name is unknown and she died between age 30 and 50. Like many Egyptians, she had terrible dental problems and had lost many of her teeth. The use of mummification was in decline as Roman culture and Christianity took hold in the country. But this woman and her family, apparently strong in their traditional Egyptian beliefs, insisted on having the procedure done. Ancient Egyptians might have been just as vain as humans today. They seem to have styled their hair with fat-based products to enhance their appearance and accentuate their individuality, new research suggests. An ancient Egyptian princess might have been able to postpone her mummification if she had cut the calories and exercised more, medical experts say. Known as Ahmose Meryet Amon, the princess lived some 3,500 years ago and died in her 40s. She was entombed at the Deir el-Bahri royal mortuary temple on the west bank of the Nile, opposite to the city of Luxor. The princess's mummified body is among those now housed at the Egyptian Museum in Cairo. Thanks to the skills of artists who work on cold case investigations, people have a chance to see what the University of Chicago�s mummy Meresamun may have looked like in real life. 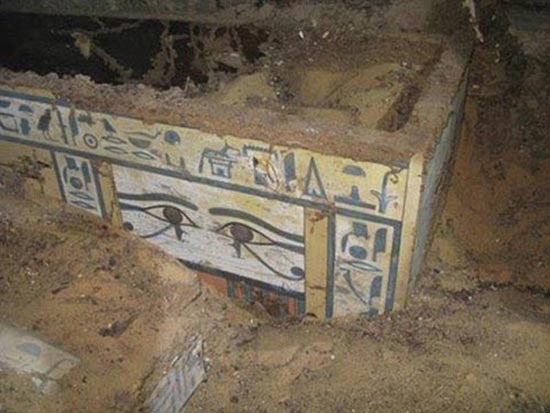 A wooden casket decorated with six different gods was among those recently found in a cache of 52 rock tombs in Lahun, a site about 75 miles (120 kilometers) south of Cairo, Egyptian archaeologists announced. Ancient Egyptians depicted gods on their coffins to protect them in the afterlife. The person in this coffin, who was likely buried 2,500 years ago during the 26th dynasty, worshiped an incarnation of the king of the gods, Amun-Ra, shown as a combination of a ram and a hawk with the sun on its head. The oldest known cases of malaria have been discovered in two 3,500-year-old Egyptian mummies, scientists announced. Researchers in Germany studied bone tissue samples from more than 90 mummies found in the ancient Egyptian city of Thebes, now called Luxor. A "modern" disease of humans may have been what sickened ancient Nubian cultures, research on more than 200 mummies has found. The mummies were infected by a parasitic worm associated with irrigation ditches.The disease, called schistosomiasis, is contracted through the skin when a person comes into contact with worm-infested waters. The disease infects over 200 million people worldwide a year; once contracted, the disease causes a rash, followed by fever, chills, cough and muscle aches. If infection goes untreated, it can damage the liver, intestines, lungs and bladder.